After learning about Henri Rousseau and his paintings of lush foliage and wild animals, the children use his style to paint jungle paintings. For ages 6 to 13. Plan 2 to 3 sessions. More information about Henri Rousseau and examples of his paintings can be found in the book Henri Rousseau: Dreams of the Jungle. While some of Rousseau's paintings are of animals preying on animals, you can concentrate on the more peaceful images. Click here to see five examples. Rousseau was born in 1844 in the French town of Laval. In high school he was an average student who won several prizes in drawing and music. After serving four years in the military, he accepted a job as a customs officer in Paris, which explains why he is often referred to as Le Dounanier. In addition to his work and caring for his family, he was able to find time to draw and paint. At the age of forty-nine he retired to become a full time artist. 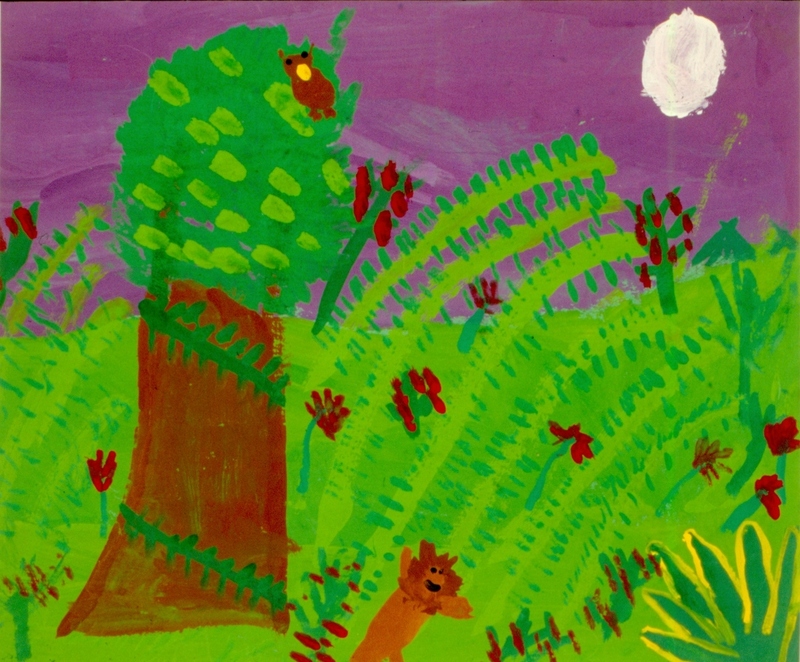 Using simple, pure colors and clear outlines, Rousseau filled his jungle paintings with animals in the foreground and lush green plants in the background. Each individual leaf and blade of grass is painted piece by piece with rich gradations of color – seen especially in the greens. The wild flowers are painted disproportionately large, and Rousseau frequently included the sun or the moon in its full orb to create dream-like settings. Henri Rousseau died in Paris at the age of sixty-six in 1910. Note: Colored construction paper adds a rich depth of color to the paintings. Use any of the lighter shades, such as yellow, light blue, pink, or peach. Become familiar with the life and jungle paintings of Henri Rousseau. 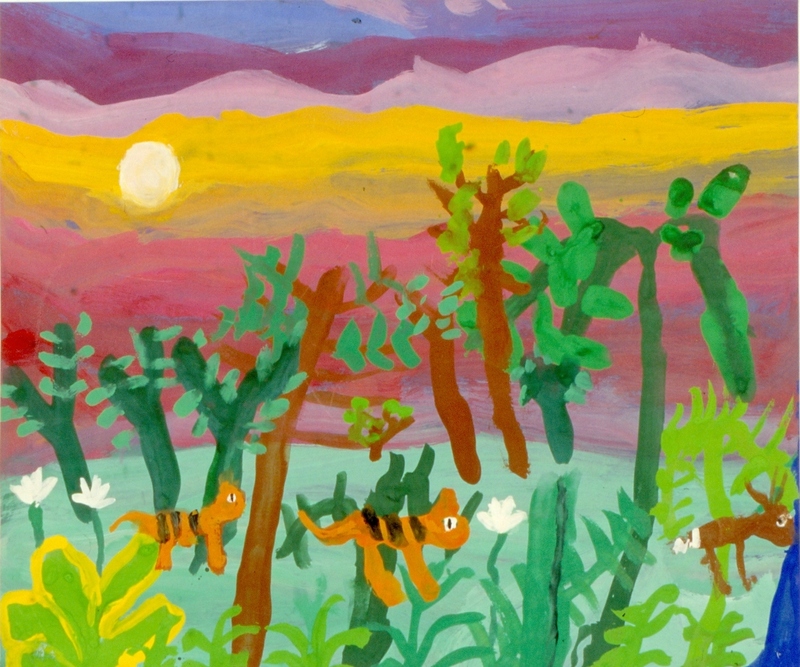 Gather examples of his jungle paintings. Set out colored construction paper, paints, wash brushes, containers of water, and sponges. 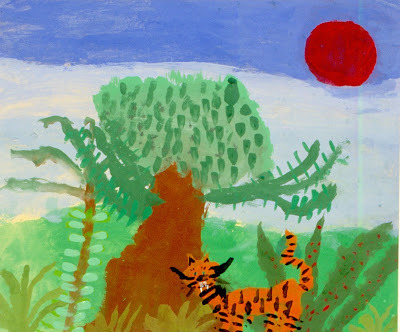 Display the examples of Rousseau’s paintings. As the children look closely, tell them about Rousseau and his jungle paintings. 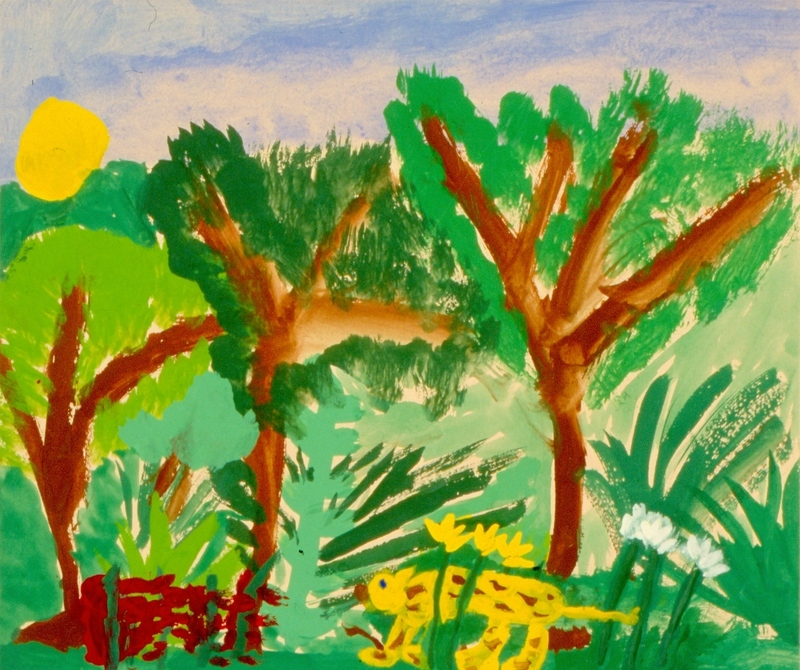 Explain to the children that in the next several sessions they will be making paintings of jungles, using Henri Rousseau’s style. Point out the characteristics of Rousseau’s paintings, such as the many shades (darkness), and tints (lightness) of each color, especially green; the abundance of scenery with animals in the foreground (closest to the viewer) and lush plants in the background (farthest from the viewer); the detailed painting of each individual leaf and blade of grass; the disproportionately large wild flowers; the sun or the complete orb of the moon in the sky. Explain to the children that to help achieve the abundant look of plants in the jungle, they will first be applying a thin layer of color, called a wash, to their papers. Show them that washes are made by adding water to the paint until it flows easily across the paper, providing an almost transparent layer of color. The children should make their washes on the mixing trays and cover the whole paper, using different colors to delineate areas for sky and grass. Be sure the children understand that the plants and trees will be painted on top of the dried wash in the next session. Have the children choose their papers; add water to the tempera paints to make washes; and then apply washes for the sky and grass to their papers. Note: If the papers ripple as they dry, flatten them under some weight so they will be easier to paint on in the next session. Set out paints, brushes for tempera paints, Chinese or round brushes, mixing trays, containers of water, and sponges. In this session, the children will first be adding plants, trees, and leaves to their paintings and then adding wild animals and flowers. Point out the many shades and tints of greens used by Rousseau. Encourage the children to create a variety of greens by mixing their paints - add blue or black for the darker shades and add yellow or white for the lighter tints. Demonstrate how to use the Chinese or round brushes to paint leaves by filling the brush with paint, gently laying it flat on the paper, and lifting it up. Repeat this process for each leaf. Discuss the variety of wild animals and flowers which might be seen in a jungle, and the sun or moon which often appears in Rousseau’s paintings. 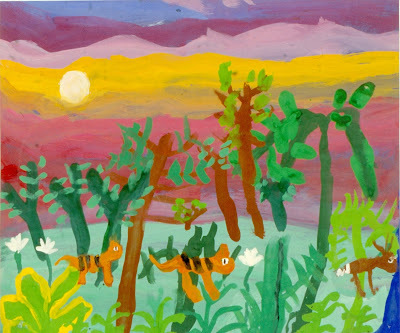 Have the children fill their papers with lots of jungle scenery, wild animals and flowers, and optional suns or moons. This is a good lesson for children to understand how to give their papers a fuller appearance by starting with a wash. The Chinese bamboo brushes make more delicate leaves than the round watercolor brushes. Both types of brushes can be used for making the petals of the wild flowers. Flat brushes made especially for applying washes are expensive. For this project, any medium to large soft bristle brush will work. To encourage the children to cover all areas of their papers with paint, tell them that the color of construction paper they used should no longer be recognizable when the paintings are finished. Are the paintings abundantly filled with trees and plants to create a jungle? Talk about the effects of applying washes to the papers. Discuss the shades and tints of colors and how they were achieved? Can I paint my sky different colors, like the sunset? I want to make a plant with very long leaves, but this brush is too short. I like putting the brightly colored flowers among my plants. My lion is roaring at the monkey in the tree. Using several colors of wash for a sunset is a great idea. Dabbing with the brush is only one of many ways to paint leaves. Try making strokes for your long leaves. Painting the bright flowers among the green plants certainly makes your painting sparkle. A lion roaring at a monkey is just the way Rousseau might have imaged his own jungle painting.